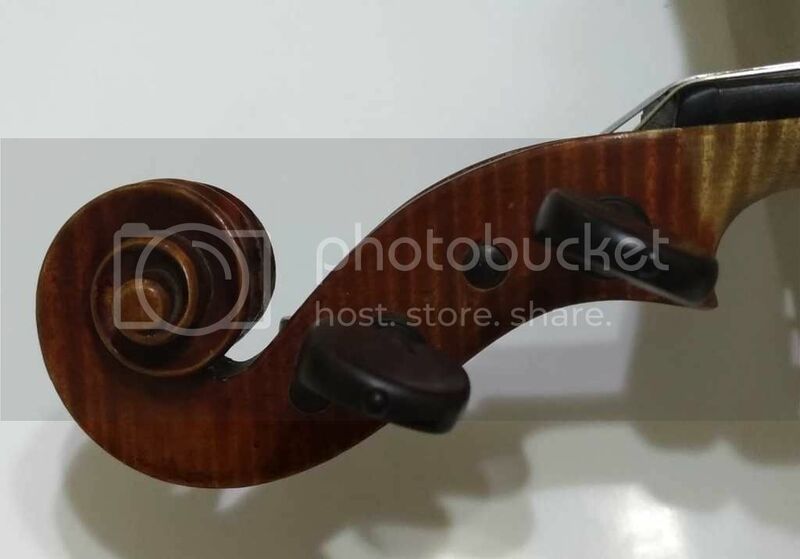 September 5, 2018, 8:25 PM · Hi guys, just wondering, are violins sold on ebay reliable? Because I just bought a Richars Gareis 1905 yesterday for more tha $20000, and when I searched online, there were ebay pages selling the exact same violin model for just a few hundred dollars! Are the ones sold on ebay fake, or was I scammed by my dealer? Edited: September 5, 2018, 8:54 PM · Richard Gareis? Googling around indicates a Czech maker, little known. Bromptons indicates auction value of under $250 in their history. $20k sounds like a scam. September 5, 2018, 9:29 PM · David, he is indicating he purchased from a dealer. September 5, 2018, 9:31 PM · "Are the ones sold on ebay fake, or was I scammed by my dealer?" Both! Two for one deal. Edited: September 5, 2018, 9:45 PM · @Erik, I removed my comment after I reread the post. But thanks for trying to enlighten me. I read faster than I think sometimes. September 6, 2018, 9:00 AM · Both. Edited: September 6, 2018, 3:34 PM · The ones on ebay are quite possibly real, in fact that might be where the dishonest seller bought it from. Sounds like a violin that should be selling for $1-2000 full retail. Is there any way to get your money back?? September 6, 2018, 7:17 PM · Twenty THOUSAND dollars? ...I can't help but wonder why you felt it was justifiable spending that much money on the instrument! ...without some prior research, even! Does it at least have the most sublime sound you've ever heard? September 6, 2018, 7:28 PM · I suspect the original post is fake. "Hi guys, just wondering, are violins sold on ebay reliable?" September 6, 2018, 7:37 PM · Maybe he's actually selling a Richard Gareis on ebay and trying to drum up interest??? September 6, 2018, 8:39 PM · I'm with George Huhn. It's the post that's a scam. September 7, 2018, 2:50 AM · Sorry but your teacher and his dealer are full of BS, I would file a lawsuit to get your money back, this is criminal, if indeed this story is true. Have you even bothered to do a google search of what other shops are selling them for. Here Ill do it for you. Maybe I just like to hope for the best. 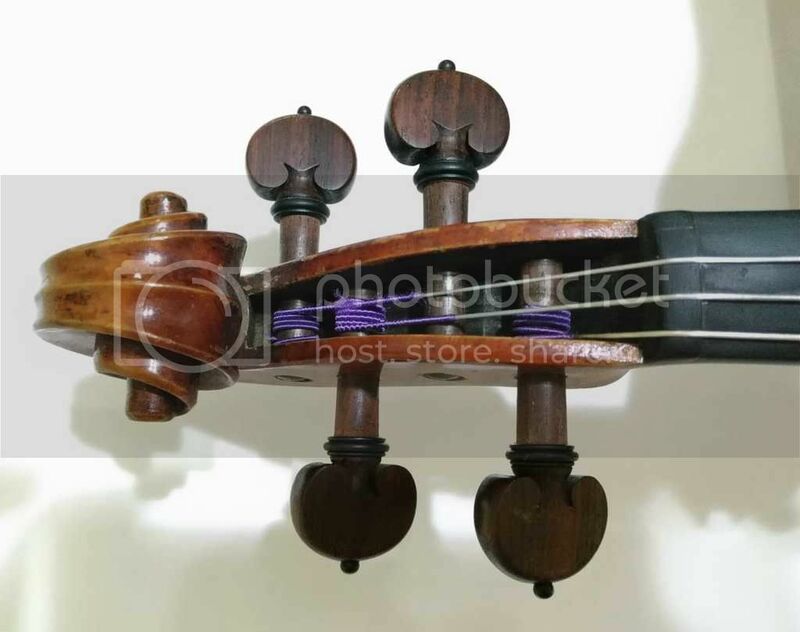 September 7, 2018, 3:13 AM · If that's Singapore I can see what you're up against, incompetent and/or dishonest luthier, pricing violins on tone, not antique value, and waiting till a sucker walks in to his shop with money to burn. September 7, 2018, 3:42 AM · The occasional $2000 violin, which is about the honest dealer price for your violin, sounds incredible, that doesn't give you the right to charge a incredible price for it, its still a $2000 violin, it just happens to sound better than most $2000 violins. That may sound ridiculous to you, but that's how the business is supposed to work. Gareis is a factory, not hand made by Gareis himself, violin. A really high priced store might stick a price of up to $5000, but anything more than that is robbery, plain and simple. Your dealer is lying to you through the teeth, there are no shops selling it for $50,000 anywhere, I couldn't even find one shop selling it, only auctions. 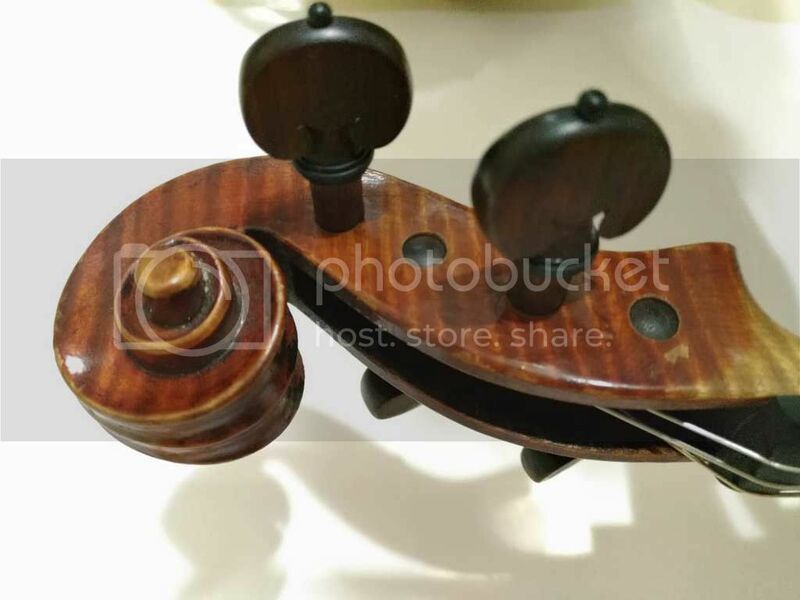 If you enjoy getting ripped of, don't do anything about it, otherwise I would say I got a second opinion that the violin is worth no where near as much, show him the auction prices and demand your money back, and seriously find a more reputable dealer. But that may be hard where you are. September 7, 2018, 3:53 AM · does it look any better than this Gareis?? September 7, 2018, 4:57 AM · Actually, the varnish does look very different (the patterns and everything). Plus my violin has a one piece back -- the one on ebay is a two piece back. My violin was bought on the spot -- my teacher actually brought a few violins to the studio, and once I decided on the Gareis, I bought it on the spot. I did blind testing, comparing it with other violins of the same range (there was a $17k one, for instance)and this really stood out for me, in terms of the resonance, richness and brightness of tone. Edited: September 7, 2018, 5:33 AM · Aren't you the least bit upset that you paid $20,000 for a $2000 violin?? I would be outraged!! Comparisons don't mean much because I'm assuming all this crooks violins are vastly overpriced. September 7, 2018, 5:57 AM · Not at all. If Isaac gets $20000 worth of enjoyment out of a $2000 violin, then he got a good value. I bet the teacher got a nice kickback. Edited: September 7, 2018, 6:39 AM · Ok I just uploaded pictures of the scroll for you guys to see because I am no judge of this kind of stuff. September 7, 2018, 6:45 AM · Looks like better quality Czech production violin, a bit better than the ebay offerings I linked to. Edited: September 7, 2018, 7:31 AM · I'd demand 25% off, 5000 dollars, because there's one string missing. September 7, 2018, 10:13 AM · Ok sure I'll record myself playing tommorow and send them tomorrow. Is there any way to upload recordings onto the thread though? It's clear that the OP got ripped off, but if he's wealthy enough, he might not care that he overpaid at least 10x for a violin that he likes. September 7, 2018, 11:36 AM · I imagine that the best thing to do is to go back to the dealer and have a tough conversation about price, in which you keep this violin that you like, but for a more reasonable price (likely the aforementioned $2k). September 7, 2018, 11:38 AM · Ok thanks Lydia, I will actually be having my violin lesson tommorrow, so if possible, I will try and talk to my violin teacher about this. September 7, 2018, 11:44 AM · The violin definitely wasn't made in 1905, by the way, and the label doesn't claim it. "Gegründet" means founded -- 1905 is the year the Gareis company was founded, not the date the violin was made. September 7, 2018, 12:13 PM · Your teacher "told" you to buy this violin at this price? It is very common for shops and teachers to have kickback arrangements. Every time a teacher sends a student to a particular shop to buy an instrument, the shop sends a percentage of the sale price back to the teacher. That's what a "kickback" is. It's unethical and puts the teacher in a serious conflict of interest but I would bet (considerably less than $20K) money that that was also going on here. I hope I'm wrong. September 7, 2018, 1:32 PM · If this happened to me after less than a week, I'd just ask to return it with no further explanation than I changed my mind and need to think about it some more, stating that maybe I jumped the gun in my exitement rather than confronting the dealer, which otherwise is likely to go on the defensive and become uncooperative. Only if he refuses would I go on the offensive, but then be prepared for a long battle. I don't know about Singapore laws, but likely you are legally entitled to a return with full refund in this short timeframe, and that would be my argument. Then I'd wait a while, and if I still want the instrument, negotiate on the basis of what "I learned since". Edited: September 7, 2018, 2:16 PM · If I were to spend $20k (or the UK equivalent) on a violin I fear I would have to think up a very convincing explanation for the D.F.A. Edited: September 7, 2018, 6:21 PM · Well, morals aside, anyone can sell anything for any price someone will pay. If I want to sell my socks for $20k and someone is willing to pay that, so be it! But it does sound like the buyer should have done some homework; I can't imagine making a on-the-spot impulse buy of $20k! September 7, 2018, 6:26 PM · Is there any way to upload recordings onto the thread though? I don't know if there's a service for audio like there is for pictures, but if you have a Google account you could upload to your Google Drive and share the file and post the link. ...or YouTube, there's always YouTube. September 7, 2018, 8:27 PM · OP didn't say he bought it on the spot. He also mentioned his teacher's influence on his decision. September 7, 2018, 8:33 PM · Andrew, actually on my violin's label it says "zal.r.1905". Does anybody have an idea what that means? Edited: September 7, 2018, 9:37 PM · As far as I can tell, "zal.r.1905" means exactly the same thing, in Czech instead of German. It almost certainly stands for "založené v roce 1905" which means "founded in year 1905." September 7, 2018, 10:34 PM · Yes, research would be one of the steps. The first step would have been to try out the violin you chose, for a few days, before committing to buy it. Usually you pick one you like, you take it home with you, you play it for a few days, research about the maker/origin of the violin. Then you buy it if you truly want it. September 8, 2018, 1:33 AM · If a certified Jan Baptista Špidlen (contemporary maker, highly sought after, waiting list to fill years) came my way, it certainly could happen that I'd buy it out of "love at first sight" for this amount, or probably even a bit more. With any other Cech violin I'd be suspicious about such a high retail value. September 8, 2018, 3:54 AM · E-Bay is like a box of chocolates, you just never know what you're gonna get. September 8, 2018, 9:08 AM · In my county, when teacher get kickback, we call "baksheesh." In Germany, they call it "Bach-sheesh." I have to wonder if there's more to this story. Even the least scrupulous dealers don't inflate values ten times. Even the worst teachers don't claim a $2,000 violin is worth $40-50k. Maybe someone in the chain of sale got very confused with the name. I once owned an old violin labelled "Galliano"--sounds a lot like Gagliano doesn't it? The thing about that ebay violin was that in appearance (of the ebay photo) it was a "dead ringer" for my father's Scarampella that I had unfortunately sold in 1959 to a Washington D.C. dealer to pay the balance of the hospital bill on our older daughter's birth. I didn't like the sound of that violin, but I have always regretted selling my late father's violin - especially since subsequently learning that many Scarampellas have been improved by regraduation. Edited: September 8, 2018, 2:40 PM · Ugh, it's not just ebay...we get roving "dealers" of instruments popping up every now and then trying to pass off relabeled, re-varnished, disguised, junk as "old vintage masterworks at bargain prices." It's been happening for decades, and they prey on students at the local universities, and unsuspecting teachers. About twenty years ago at an informal showing at the local university music program, someone was passing around a "Nicolo Gagliano" with a label from the 1800's...except that he died in 1780. When I brought up the inconsistency, I was asked to leave as I didn't "appreciate the work done by the collector to make fine instruments accessible for students." Liars and scammers, all of them. And it makes it really difficult for any legitimate seller to put their work on ebay, because there's so much fraud out there.